For the past month I have been trying several Purito serums – it is not the first timed. I have already tried some of their essences and the whole Green Centella line and they are all very gentle but at the same time very effective. All their products are free from paraben, alcohol, and artificial colorants and fragrances, and are cruelty free. I have to honestly say that I am very happy they reached out to me in the first place. Purito is one of the Korean beauty brands that never disappointed me. With such safe and affordable products, how can I not? Keep scrolling to see the products I used regularly to achieve flawless skin! The triple synergy liquid has been one of the products I wanted to try as soon as I saw it out! It’s a combo of AHA, BHA and PHA that will gently exfolitae your skin without irritating, and works for most skin types. I have been using the triple synergy liquid as both toner and essence. In the morning, it would be the first product to use on my face, followed by moisturiser with SPF. In the evening, I would use it as both toner and essence – first time swiping with a cotton pad and second time tapping it into the skin gently. Then I would follow with serum, eye cream and night cream. In the beginning, I used it twice per day every day. I had no irritation for the first week, but I did have small breakouts on my nose and chin. After the 7-10 days, I noticed my skin getting irritated, so I reduced the triple synergy to only evenings. I have to say that regularly using is, it keeps my skin smooth, and reduces the blackheads on my nose. 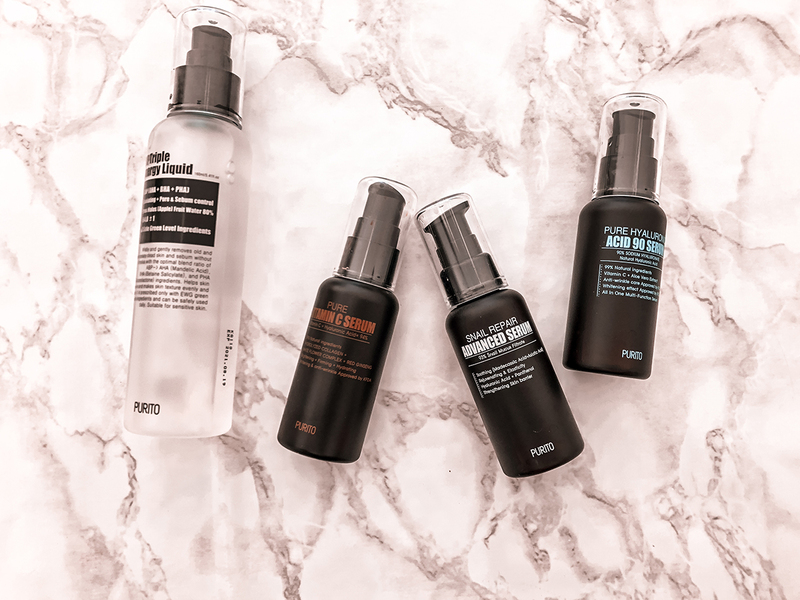 The Purito Serums below are amazing, but I would advise to use them one at a time. That is, I would not use them as part of the same skincare routine, but would use the second one as soon as the first one is empty. This way, you are no stressing out the skin with too many new products. This is one serum I was very excited about. The Purito Pure Vitamin C Serum contains 84% hyaluronic acid and 10% ascorbic acid. After a not so god experience with the Freshly Juiced Vitamin Drop from Klairs (made my skin irritated all day, no matter what I did…) I was hopeful I could find a gentle vitamin C serum. And I did! This Purito serum has a rather sticky texture but absorbs quickly into the skin. I am using 2 pumps of this every evening, for the face and the neck. Compared to the Klairs serum, which is clear, this one is already a bit orange. The Vitamin C Serum helps with brightening the skin, facing acne scars, and diminishes sun spots and dark circles. I would usually apply the serum after the essence step and then follow with moisturiser. If you use the Vitamin C Serum in the morning, make sure to apply SPF afterwards. The Hyaluronic Acid Serum is 90% hyaluronic acid and, as we all know, is great for hydrating the skin and reduces the fine lines! Compared to the sticky texture of the Vitamin C Serum, the Hyaluronic Acid Purito serum is more watery, but doesn’t absorbs as quickly. It doesn’t cause any irritation and I am using it twice per day, between essence and moisturiser. This serum right here is amazing and it is the second time that I am using it. It contains 93% snail mucus filtrate, plus hyaluronic acid, so it will help with hydrating the skin and preventing fine lines. It is extremely gentle on the skin, so even if you have the most sensitive skin, it should be all be fine. One could easily use it twice per day, after the essence and followed by moisturiser with SPF or sleeping cream. Have you tried Korean skincare or any of the Purito serums? If not, would you give them a try? Don’t forget that you can get your hands on them on most K-beauty websites so no matter where you are in the world, you can check the out! I can’t say that I have ever tried any Korean skincare items. I have seem some of them in a Korean store that is not too far from where I live. Maybe I will try one or two when I go there again. Are they applicable for any skin type? I love their packaging. It’s full on info inside. Do you recommend all of them? I have combination skin and they all work well for me all over the face. However, I would always do a patch test with a new product. These serums sound amazing. The elegant packaging is a big plus. Thanks for sharing! Whatever gives me a flawless good skin and doesnt have any negative side effect is good to go. I kinda like the content of this serum and sure it feels safe than someothers out there. I love Korean make up and skincare but I have never heard of the Purito brand. That snail serum looks interesting. I’m going to look into this! Would love to hear a testimonial from someone who’s tried this product consistently for a few months. I like using certain serums in my skin care routine, but many of them are hit or miss. I wonder which category this would fit in? I love how sleek the packaging is. Ive heard amazing things about korean skincare but I have never had the opportunity to try it. Sounds like a good gift idea, just in time for the season. Thanks for shield. Looks like a great skin care line! Love the packaging and colors. Going through the list of products, I had to pause over the Snail one. Interesting to hear how this benefits your skin. I haven’t heard of such before. Will have to do some research into this. These products sound very refreshing for your skin! I´ve never tried this type of skincare. But, i´m so bad at taking care of my skin. Hehe. These look so good! I would love to get my hands on them and try them all on (especially the vitamin C one). Thanks for sharing. Sounds like interesting products! Serum is always handy for face, it adds so much power to skin!